As a crafter I love it when you have an idea in your head,(mine usually come into my head in the middle of the night when I am trying to sleep) 😀that actually translates to my project the way I saw it or better. 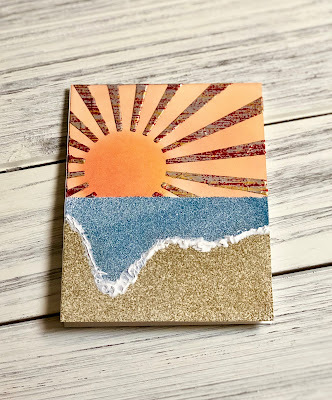 That is how this beach scene card came to be. Today I am using Brutus Monroe products. I have said it before and will say it again, if you have not checked out Brutus Monroe you are missing out! They have innovative, fun, creativity run wild products. First I taped off a panel about half way down with purple tape and I used the rays stencil from MFT. To outline where the sun will be on my scene. 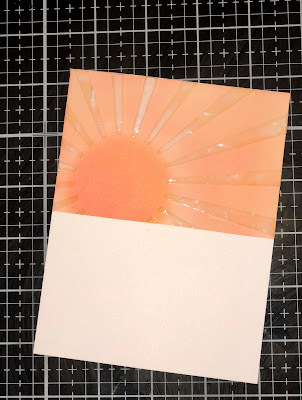 Next, I used three colors of Distress Oxide, abandoned coral, squeezed lemonade, and carved pumpkin with a blending tool to add color to the setting sun and sky. 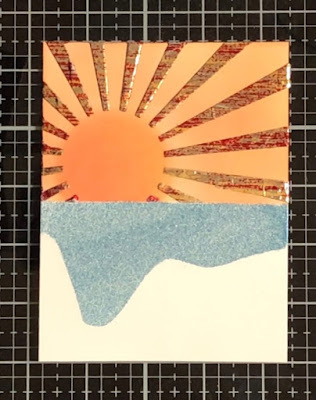 Once the sky and sun were the colors that I wanted I taped the stencil back down to the panel and used deco foil transfer gel for the rays of the sun. 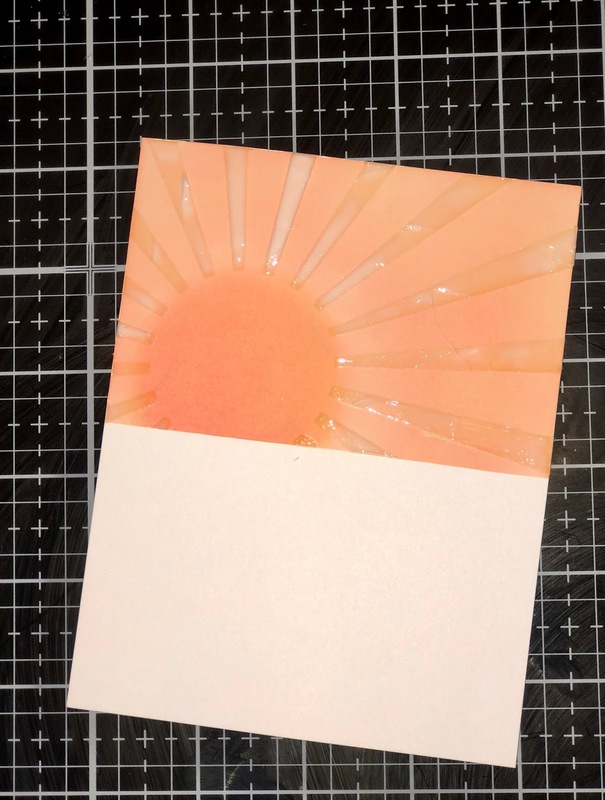 After the gel dried I added Brutus Monroe Sunrise deco foil by running it through a laminator. The foil adds beautiful gold/red color to the rays of the sun. 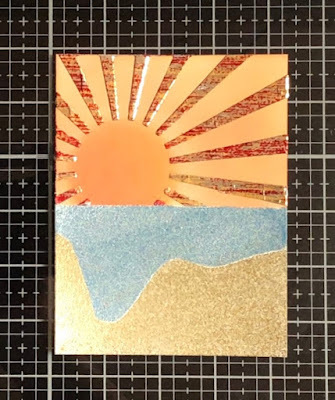 Deco Foil transfer gel after it has dried. It will dry clear. For the water I cut a piece of Brutus Monroe masking paper. I have used a lot of masking paper over the years and this is by far my favorite. It has just enough sticky to not peel up off of your project, but not enough that it is hard to remove. The paper also has slits in the backing so it is easy to remove. I wanted the water to appear as if it was a wave that had broke on the beach. I made one part higher and cut the rest at a slight angle. 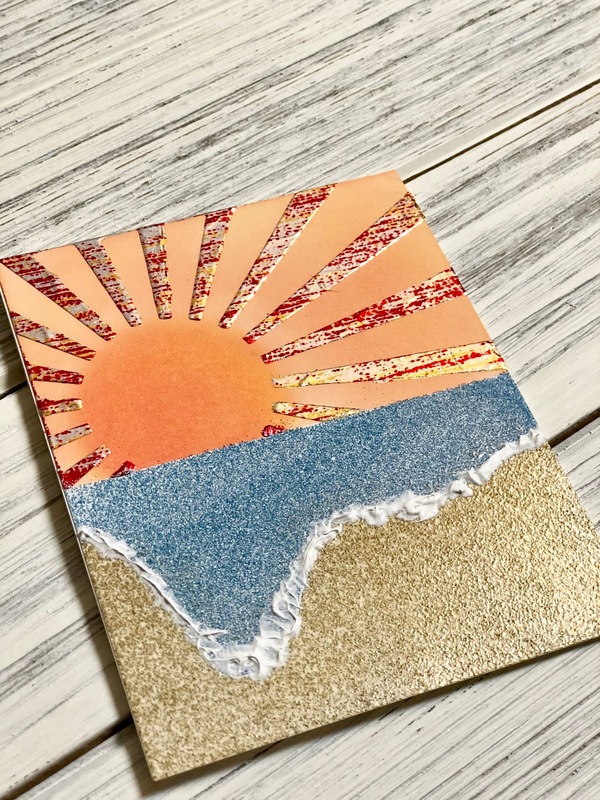 For the water I decided to mix three embossing powders from Brutus Monroe. I mixed mermaid tail, alabaster and then added icicle to give it a little shimmer. 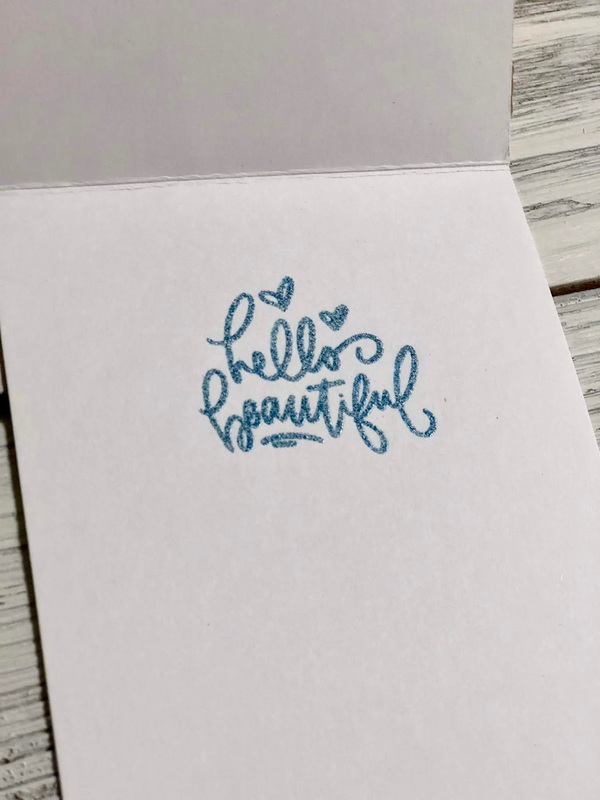 I got this idea from visiting the Brutus Monroe studio store where they have an embossing bar that allows you to mix and make your own colors of embossing powder. Brutus Monroe Embossing Bar at the Studio Store in PA. While the mask was on the sand area and covering part of the sky/sunset I used the Brutus Monroe embossing ink on my panel. 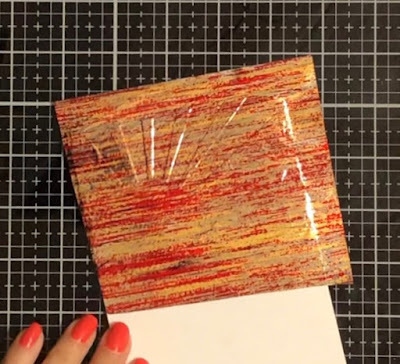 After removing the mask I added the mix of embossing powder and heat set it with my Wagner heat tool. Next, I masked off the water using the other half of the masking paper and used Brutus Monroe Sandcastle embossing powder using the same technique I did for the water. For the finishing touch on the front panel I used Brutus Monroe Media Paste. This stuff is amazing. It stays white once on your project and also gives texture. This was perfect for the "foam" of the water on the sand. I used a pallet knife to add to the edge of the water where it meets the sand. It gave the beach scene a realistic look by adding the extra texture. It dries fast and does not flake off. For the sentiment I thought about putting it on the panel, but decided to add it inside. 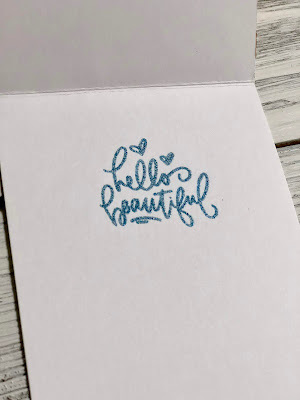 I used the sentiment Hello Beautiful from Brutus Monroe Super Sentimental. 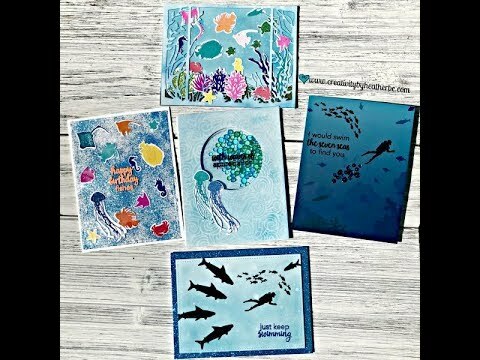 This is a fantastic sentiments stamp set. There are so many occasions this can be used for. I hope you will give the new Brutus Monroe Deco-Foil's a try and let your creativity run wild with foil.